A number of weeks ago, we reported that a new range of articulated action figures were coming, based on Shishi Red from Uchu Sentai Kyuranger. Initially thought to be the return of Super Sentai S.H. Figuarts, it quickly emerged that these figures were in fact Shokugan (SG) Candy Toy releases, similar to the recently produced Kamen Rider Ex-Aid SODO figures. 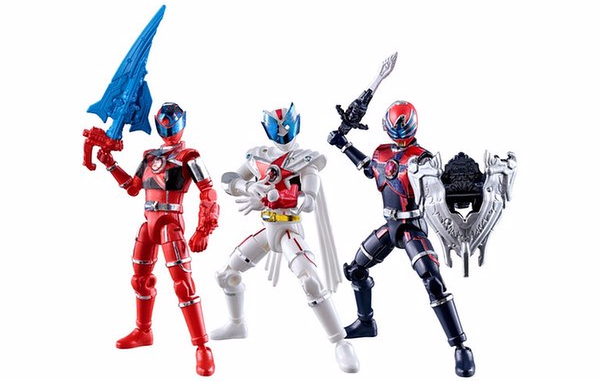 Bandai Japan have now released more information about these figures. In this first wave, the figures for Shishi Red, Houou Soldier and Shishi Red Orion will be released. The figures stand at approximately 11cm/4in tall. The Uchu Sentai Kyuranger YUDO Figures will be released in December 2017 and will be available at Toku Toy Store. Will you be picking them up?